A LOCAL campaigner has branded a recent review of accessibility for disabled people at Melksham Hospital as ‘unacceptable’ after it failed to acknowledge the concerns she raised about the ‘dangerous’ pedestrian access to the site nearly a year ago. 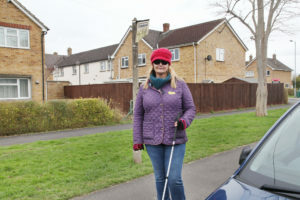 Caroline Fielding, who is registered as blind and relies on a guide dog, first raised her concerns in February last year about there being no footpaths or safe areas for pedestrians to use to walk up to the hospital from Spa Road. Months later in June, Caroline had yet to receive a formal response to her complaint. When prompted by Melksham News, NHS Property Services explained that a specialist disability charity would be assessing the site as soon as possible. However, the assessment carried out by AccessAble which was published this month, makes no reference to Caroline’s concerns about pedestrian access between Spa Road and the hospital. Caroline said, “It is unacceptable, they haven’t addressed the issue. Yes they’ve looked at things like the steps outside the hospital, but not the reason I contacted them in the first place. I cannot access the hospital independently as a pedestrian. I can get off at the bus stop on Spa Road and walk to Giffords Surgery on my own – this is completely accessible, but that’s where it ends. Pedestrians can’t safely access the hospital as there is no path! “As a hospital, they will have many people visiting with mobility issues, so you think this would be something that they would want to address. They should be more like some of the bigger supermarkets who are very user-friendly and accessible for people like me. In response to questions from Melksham News about why Caroline’s complaint had not been considered in the review, NHS Property Services has asked Caroline to meet them on site to discuss her concerns.